Aspire Cleito Pro Mesh Coils have been designed specifically for the new Aspire Cleito Pro tank but are compatible with the Cleito tank range too. We offer both the standard and the Cleito Pro Mesh coil options. These coils are designed for maximum flavour and vapour production by replacing the traditional static chimney found inside most e-cig tanks. Cleito Pro coils are designed so that the coil functions as the air flow chimney, this reduces restrictions and frees up air flow allowing for more vapour and better, richer flavours, the new wicking system avoids dry hits. Both coils are excellent for vapour production and compatible with Cleito and Cleito EXO tanks. 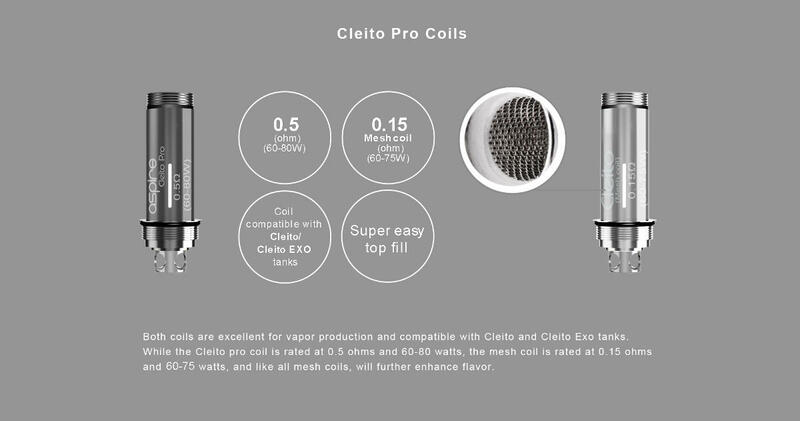 While the Cleito pro coil is rated at 0.5 ohms and 60-80 watts, the Cleito Pro Mesh coil is rated at 0.15 ohms and 60-75 watts, and like all mesh coils, will further enhance flavor. Aspire UK is a relatively new-comer to the vaping scene, established in 2013. 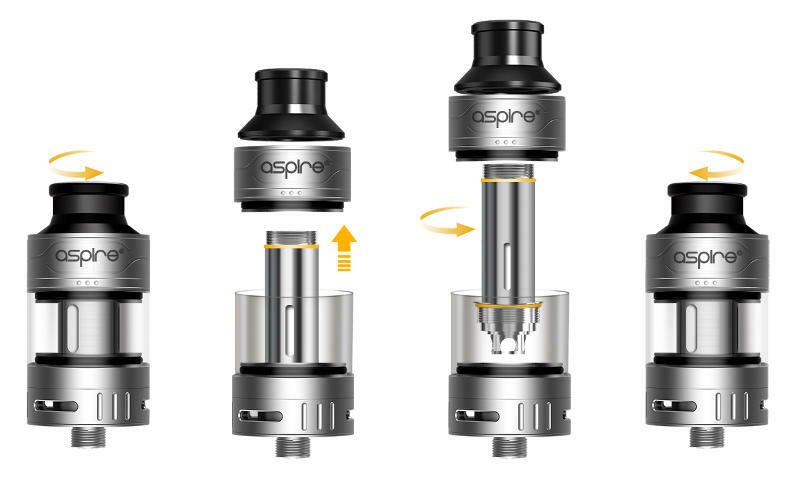 However with over 25 patented products like the Cleito Coil, Aspire have quickly moved to the forefront of the vaping world. The Aspire Cleito and Nautilus range of tanks gained a reputation of being a quality device and a very simple but excellent tank. The Cleito Tank, Cleito coils and accessories take vaping to the next level and the Aspire tank is now recognised as being one of the best tank systems available for 2017. Please Note: Make sure you are using a compatible battery that is capable of supporting Cleito Pro sub ohm resistance levels for TC coils. See our batteries which are compatible. To avoid coil damage make sure you prime the new coil by dripping 3-5 drops of e-Juice onto the cotton held within the coil and leave to soak for 2-3 minutes prior to vaping. Our help desk team are there to help you if you need advice or assistance. To avoid damage to the Cleito Pro coil and Mesh coil wick in the atomiser head always make sure you prime your coils by adding few drops of e liquid to the Cleito Coils and waiting a minute or two prior to vaping. Your Cleito Coils are manufactured with precision so will not leak providing you use the product and parts correctly. Where any leaks have occurred, we have solved almost all by taking the following steps. Close the Cleito Pro air flow when not in use. Ensure you have the correct temperature/power settings for your particular device. The Cleito Pro coils have ratings and should be kept within maximum and minimum recommended settings. Too high and your device will pop and crackle which may cause spots of e liquid to escape via the air-intake.